This report is the third in a series of stories on Asbestos.com commemorating Lung Cancer Awareness Month throughout November. Our other stories focus on awareness, research and funding. Part two of our series: Raising Awareness for Lung Cancer Screening and Prevention. Part four of our series: Lung Cancer Survivor Jazzes It Up to Raise Funds, Awareness. Lung cancer research and the advances it sparks doesn’t happen without good funding. And good funding doesn’t happen by accident. It takes a commitment from a wide range of sources. November is Lung Cancer Awareness Month, and it’s already filled with educational events, donation opportunities, declarations and inspirational stories of survival. It is a reminder that the battle is far from finished, and that increasing financial support for research is more important than ever. Lung cancer research has been key to the slow, but steady progress made recently in areas of prevention, early detection and improved treatment options. 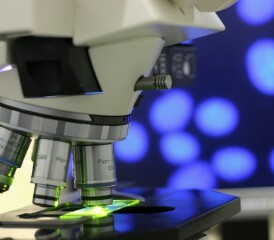 But inching closer to a cure in the future will require the on-going vigilance of many organizations large and small to keep the research alive through increased funding. Research provides hope. It saves lives. But it doesn’t come cheap. The National Cancer Institute, which is part of the U.S. Department of Health and Human Services, provided $285.9 million for lung cancer research in 2013, easily the largest funding source. The American Cancer Society, the largest private, volunteer health organization in America, has contributed more than $28 million for on-going lung cancer research projects today. The American Lung Association, the oldest voluntary health organization in the country, has earmarked $1.6 million in 2014 for lung cancer research. Free to Breathe, which is part of the National Lung Cancer Partnership, has contributed more than $4 million since 2005 for research. The Lung Cancer Research Foundation funded 16 grants worth a combined $800,000 in 2013. United Against Lung Cancer has awarded $11.5 million since 2003 to investigators researching new treatments. LUNGevity Foundation, the largest lung cancer-focused private funder of research in the U.S., has spread $19 million across 110 different projects in 23 states since its inception in 2002. Upstage Lung Cancer, which raises money using theatrical and musical entertainment shows, has funded $800,000 worth of research aimed at early detection since 2011. It hopes to crack the $1 million mark this year. This fundraising-for-research approach to lung cancer also has become a priority in places outside the U.S. The Lung Foundation Australia celebrates its own Lung Health Awareness Month each November in much the same way. It has provided more than $4 million in funding to lung cancer research in the past 20 years. Research today focuses on a variety of lung cancer issues. Research has helped in understanding exactly how it is caused, how it can be detected earlier, how and why it spreads, and how the different types are best treated today. Despite the efforts, though, lung cancer remains the leading cause of cancer deaths in the U.S. An estimated 224,000 new cases will be detected this year, and nearly 160,000 people will die from lung cancer. The biggest reason that less than 20 percent of lung cancer patients live more than five years after being diagnosed is the obvious symptoms of the disease don’t appear until the cancer already has spread, severely limiting the treatment options. It has made early detection one of the most researched topics. Recently, a major study uncovered a method of earlier detection that could reduce future lung cancer deaths by 20 percent. Immunotherapy, in which a body’s own immune system is triggered into fighting the cancer, is being closely researched. Better targeted and more individualized treatment options, surrounding the identification of genetic mutations in lung cancer, are being tested in clinical trials. The scattergun approach of chemotherapy, which kills both healthy and cancer cells, is slowly being replaced by newer, more precise therapies developed through recent research. Despite these advances and money being poured into various disciplines, many believe that lung cancer research still is underfunded by comparison to other cancers. 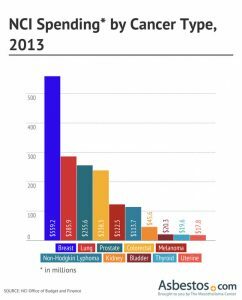 Although lung cancer funding from the National Cancer Institute ($285 million) trails behind the agency’s funding for breast cancer ($559 million), the per-death breakdown of funding tells a much different story. More people die from lung cancer each year compared to breast, colon, and prostate cancers combined. According to research by LUNGevity, only $1,442 is spent annually per lung cancer death, compared to $26,398 per breast cancer death, and $13,419 per prostate cancer death. “Lung Cancer research has been woefully underfunded,” said Dr. Denise Aberle, thoracic radiologist at the UCLA Medical Center and Scientific Advisory Board Member for LUNGevity, in a recent press release. Unfortunately, little of the $250 billion settlement between the major tobacco companies and federal and state governments has gone to lung cancer research, according to a review of the Government Accountability Office report. Tobacco isn’t the only cause of lung cancer, but Edelman estimates that 85 percent of those diagnosed smoke or formerly smoked. Another cause of lung cancer is an exposure to radon or asbestos, the naturally occurring mineral that was used so extensively throughout much of the 20th century. Asbestos is also the leading cause of mesothelioma, a cancer that develops in the thin lining of the lungs, heart or abdominal cavity. Edelman, Norman, M.D., American Lung Association, chief medical officer, interview with Asbestos.com (2014, Oct. 30). Allen, Heather, CEO, Lung Foundation Australia, interview with Asbestos.com (2014, Oct. 28). 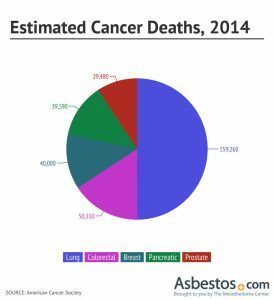 Green, Chris, senior director, American Cancer Society, interview with Asbestos.com (2014, Oct. 27).